In this classic salad from the mountainous region, there is a pleasing contrast between the sharpness of the salad leaves and the sweetness of the local blue cheese. The cheese tastes best when it’s eaten at room temperature, so remove it from the fridge at least an hour before you serve it. Preheat the grill. Break the cheese into chunks using a fork. Whisk together the ingredients for the dressing. Toast the slices of baguette and top with chunks of cheese. 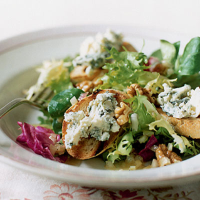 Arrange the salad leaves and baguette slices on plates, scatter over the walnuts, pour over some dressing and serve. There are lots of intense flavours to absorb here, so match this salad with a broad-shouldered rosé from the southern Rhone.